It's time for another HOLIDAY edition of Five on Friday and I do hope you'll join me, Darci, Christina, and Natasha! We have a jam-packed weekend ahead of us ... a concert tonight, some holiday fun Saturday afternoon, a mamas + babies night Saturday, and meeting Ho-Ho on Sunday! Kid's holiday clothes are too much fun. I am enjoying this season more than a person should just for the fact that I can dress C up in fun clothes! For my girlie night on Saturday, I think a new cocktail recipe is in order -- any suggestions? I would like something not too sweet, maybe something that involves rosemary, and I also have some cranberries on hand if that helps. Hit me up with some fun ideas! 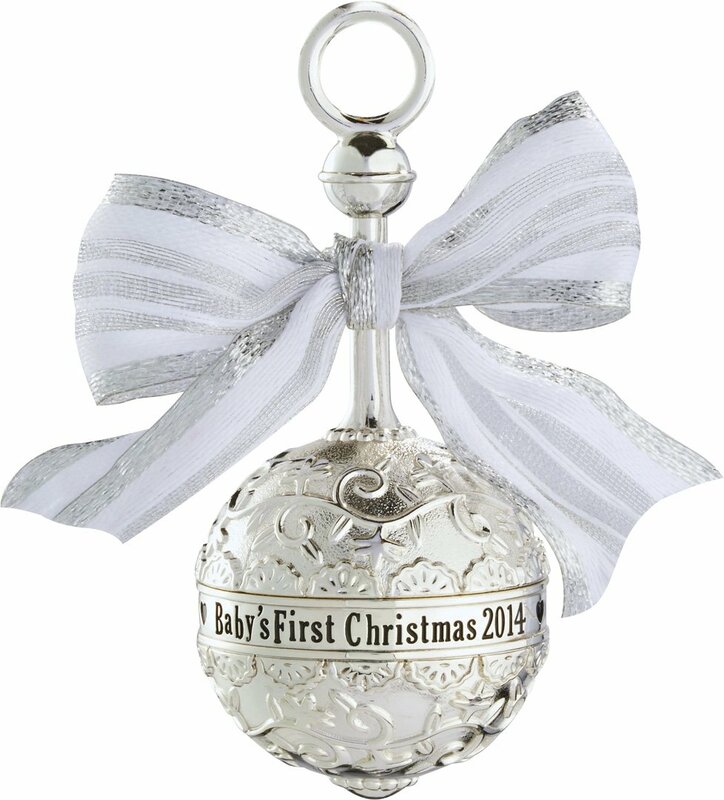 On my Christmas list to Ian I'd like a "Baby's First Christmas" ornament for our tree. Which gets your vote? I think I know which one I love. As I sit here sipping (gulping) my coffee ... I need this mug in my life. On sale now for $14.99. Santa -- take notes! How's your list coming along? Are you done with your shopping? I'd say I'm about 30% done. Maybe even just 20% done. TGIF y'all, and hope you will join in on Five on Friday this week! Cheers to the weekend, and I hope you find yourself under the mistletoe with the one you love. Such fun Christmas cheer! I love those trees, so pretty! I love ornament 1! So classy and pretty! I love the third ornament! So pretty :) Have a happy weekend!! This Holiday 5 post was so fun to read. I'm blaming you for me clicking on the ornament link. I will be purchasing the first one today!! I love that tee and bloomers...too cute!! I love the 3rd ornament, but any would be so special!! I always love unpacking MY OWN first ornament and am so glad my mom saved it! :) Have fun this weekend!! I'm a fan of ornament #1. Also, not quite a cocktail.. but mulled wine served with orange segments and cinnamon sticks is always fun and very festive if you have access to a crockpot. I would recommend getting which ever ornament you love best that will not break! There is too much room for accidents as the children grow older. Those bloomers are precious! All the little Christmas dresses I see around are way too stinkin' cute! Love all the ornaments but I think I like the last one the best. Happy Friday! Those bloomers... my word!!!! And isn't Christmas (and holidays in general) so much more fun w/ a mini in tow? Excited for y'all! And I'm going to be reading all the comments for good Christmas cocktails --- love hearing recommendations first hand! I love all the ornaments -- but choice 1 looks like the least likely to ever get broken. I vote for that one. For a fun holiday drink that involves Rosemary - I had a great drink last year for a Girls Night. Wet Rosemary and roll it in sugar. Put the sugar Rosemary directly in your glass of Prosecco or Champagne- add Cranberries or Pomegranate seeds for color! I'm about 80 percent done with shopping! PTL. I loooove ornament 3. I've been enjoying cranberry ginger ale and bourbon lately! I freeze some fresh cranberries as a festive way to help keep it cold, too. Love ornament number one. Enjoy your weekend! Ornament one is my favorite. Very classy and will match your tree every year for many years to come! I love the first ornament! We are in the same boat, I have so much more shopping to do! Yikes! And my vote is for the middle ornament. Classic. The first ornament without a doubt! 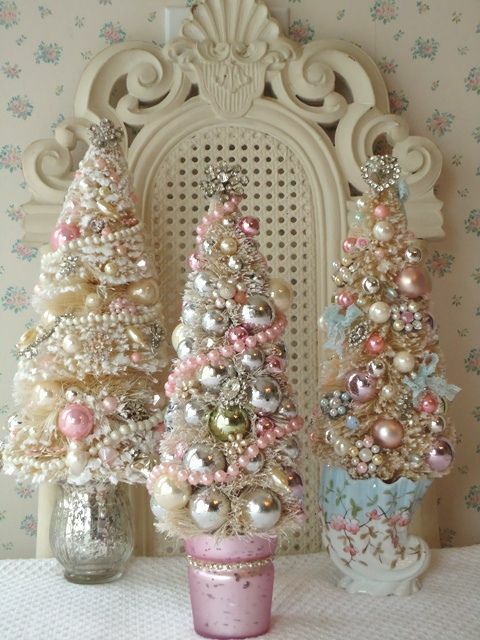 I love those Christmas trees - the pastel colors are so different!